Ready to feel awesome? Chiropractic care can help by looking at your nervous system and clearing up any interference between the brain and the body’s communication. Dr. Tiffany mainly uses the Diversified manual technique to adjust, along with a combination of various techniques, including some instrument adjusting, to find areas of irritation. Then, she determines how to remove that irritation, so your brain and body communicate better. The result is your body’s innate ability to heal is released so your body can do what it’s designed to do. Dr. Tiffany will assess all skeletal alignment in your body. Dr. Tiffany is very skilled at reading a patient’s body to know when to use a manual adjustment and when to use instrument adjusting. 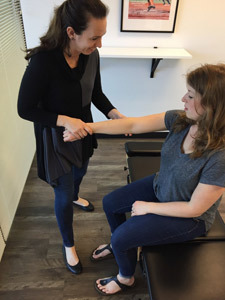 She finds that some people like to be eased into chiropractic with instrument adjusting, which doesn’t involve any sound or the use of a quick motion. Discover the many benefits of safe and natural chiropractic care. Get ready to feel awesome by contacting us today to schedule an appointment!